Are you in need of a translator or an interpreter? The world is changing, and fast. We can see the evidence of these changes in the world of travel and in particular, with the growing number of people choosing to work, study or live abroad. Whilst ten or twenty years ago, someone moving to another country would have been considered as somewhat of an exception, it is now considered to be normal practice, whether on a temporary or a more permanent basis. This massive life decision not only enables the individual to experience a new way of life, exploring a different culture and grasping a new language, but such an experience can also open doors for new opportunities whether at home or abroad. Whilst the first thing that you might think about when considering your move abroad, is how to go about learning the language, it is also important to organise the specific documentation that you will need, which will allow you to work, live, study and basically survive abroad. If you are moving to a country which speaks the same language, copies of this documentation may be sufficient, but if you are moving to a country with a different official language, you will more than likely need a certified or Sworn translation of your documentation. I imagine that you are all aware of what a translation exactly is, but you may not be aware of the process that is involved in translating documents and even less so, in the case of Sworn translations. You probably have a whole list of doubts that you are hoping to resolve, but you don’t know where to look. What is a Sworn translation? Can any translator provide a Sworn translation? How much does it cost, and how do the translators decide on the price? How long will it take? The translation profession is a relatively new one, but due to the expansion of the global market, it is one that is growing rapidly. In Spain, a certified translation is a translation which is carried out by a translator who is authorised by the Spanish Ministry of Foreign Affairs to give legal validity to the translation of the content of a document written in another language. In other words, the translation will be a true and faithful copy of the original document and as such, will have the same validity. Here at Traductores Oficiales we receive a large variety of official documents that need to be translated by a Sworn or certified translator everyday, the most common types of documents that we receive are academic documents such as degree certificates and academic transcripts, and civil registry documents including marriage and birth certificates. 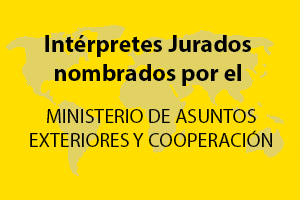 Due to their official nature, these documents must be translated by a Sworn Translator in order for them to maintain the same validity as the original document and in order for them to be accepted by official organisms in the country where this documentation is going to be presented. When I need a certified translation? If you are interested in studying abroad, working abroad or even getting married abroad you will definitely need certified translations of your documentation. For example, if you are interested in studying in a country which has a different educational system, it may be necessary to provide certified translations of your academic transcript or even part of the syllabus, in order for the admissions committee to assess whether the studies that you have carried out and the qualifications that you have been awarded, are equivalent to those from that specific university or school. If you are interested in finding out more about certified translations, or if you would like to request translation or interpretation services, please don’t hesitate to contact us, by email, phone or by calling into one of our offices and we will be happy to help you with all your translation needs.